According to the American Society of Civil Engineers (ASCE), more than 26% of the nation’s bridges in 2009 were classified as either structurally deficient or functionally obsolete. Two years later, structurally deficient or functionally obsolete bridges still made up close to 24% of the nation's total bridge infrastructure. A report by the Federal Highway Administration (FHWA) indicates that, given more time and funding to complete bridge inspections, the use of non-destructive evaluation (NDE) methods would increase among state and county transportation agencies (Highway Bridge Inspection: State-of-the-Practice Survey, 2001). NDE promises a way to enhance the allocation of funding by improving the information these decisions are based on and by improving the assessment of existing bridge conditions and through increased safety of inspection crews, reducing traffic disruption, and increasing the frequency, objectivity, and accuracy of bridge condition assessment. 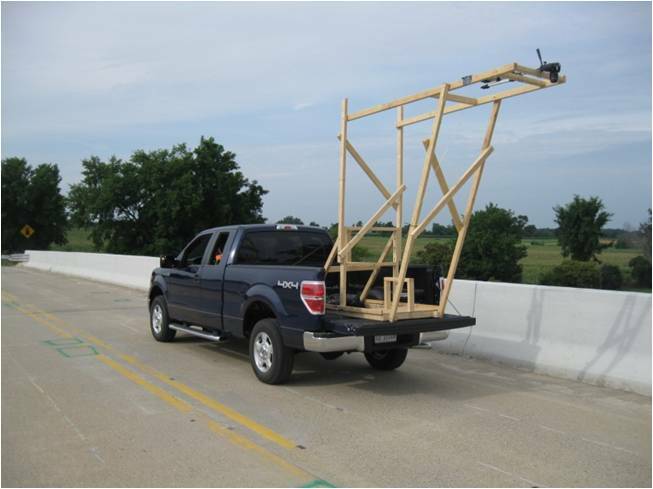 As part of research funded by USDOT-RITA, the 3D Optical Bridge Evaluation System (3DOBS) was developed to quickly assess the condition of bridges while minimizing traffic disruptions and limiting inspection crews' exposure to traffic. 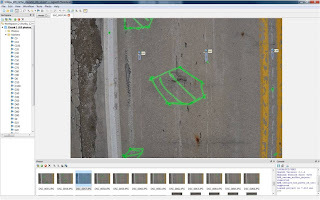 The system is composed of a Digital Single Lens Reflex (DSLR) camera mounted on a truck, close range photogrammetry software (Agisoft PhotoScan Pro) and an automated spall detection algorithm. 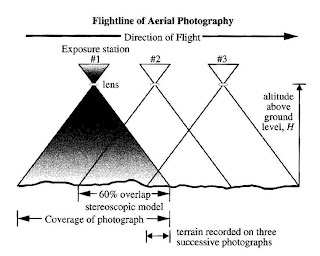 For close range photogrammetry to be achieved, the photos need to be collected with at least 60% overlap. Early testing of the photogrammetry software showed that collecting imagery with greater overlap produced better results. Prior to the collection of photos, the bridges had to be marked with reference points for Agisoft to set up a coordinate system and to create a DEM. These reference points were marked duct tape that was placed on the bridge deck in a grid pattern. The tape was placed at four foot intervals in the transverse direction and at ten foot intervals in the longitudinal direction. Carrier phase GPS points were collected with a Trimble GPS (with an accuracy of <1m) at each of the four corners of the bridge deck and at various other points on the deck to be able to correctly spatially reference our data. For the collection of the photos, a standard consumer grade Nikon D5000 DSLR with a resolution of 12.3 megapixels (MP) and a 27 mm focal length lens were used. In order to capture a full lane in one pass the camera needed to be mounted 9 ft above the bridge deck. In order to achieve this height, a wooden vehicle mount was constructed to fit into the bed of a standard pickup truck. During field collections a control board was programmed to trigger the camera shutter at a rate of one image per second. With the camera mounted, the truck was driven across the bridge deck at a speed of about 2 mph. This speed ensured that images were captured with the required 60% overlap between the photos. After the photos were collected they were processed in Agisoft PhotoScan Pro. This process was mostly automated as the software aligned the photos and generated a 3D model without any user input. After the model was generated it was necessary to manually add "KeyPoints" to mark the location of each one of the duct tape markers with the latitude and longitude coordinates. This allowed PhotoScan to set up a coordinate system and to accurately reference the model and create a Digital Elevation Model (DEM). The DEMs that were generated have a resolution of 5 mm in the x, y directions and a z resolution of 2 mm. The spall detection algorithm was written in Python programming language and uses ArcPy to interface with ArcGIS and utilize some of ESRI’s available geospatial tools. The tool used to detect spalls is called Focal Statistics analyzes each cell in the raster and calculates statistics based on a specified neighborhood of cells around it. Additional functionality was added so that the user can remove bridge joints by creating a shapefile that defines the bridge joints. Spalls can also be identified based upon their area. This feature allows for the detected spalls to correspond to minimum size definitions and allow for the removal of small artifacts in the DEM. The data processing is automated, and only requires the user to set the working directory, file names for the DEM and bridge joint shapefile, focal statistics sensitivity and the minimum spall size. Enhancements are currently being made to this system through a project sponsored by the Michigan Department of Transportation (MDOT). These enhancements will include improving the camera so that the system would be able to operate at near highway speeds (40 mph) and the construction of a more sturdy vehicle mount. The spall detection algorithm will also be improved. The current version of the algorithm simply looks for a change in the elevation and therefore it also detects the edges of patches on the bridge and reports them as spalls. This will be changed so that the algorithm will only detect negative changes or those that represent spalls on the bridge deck. 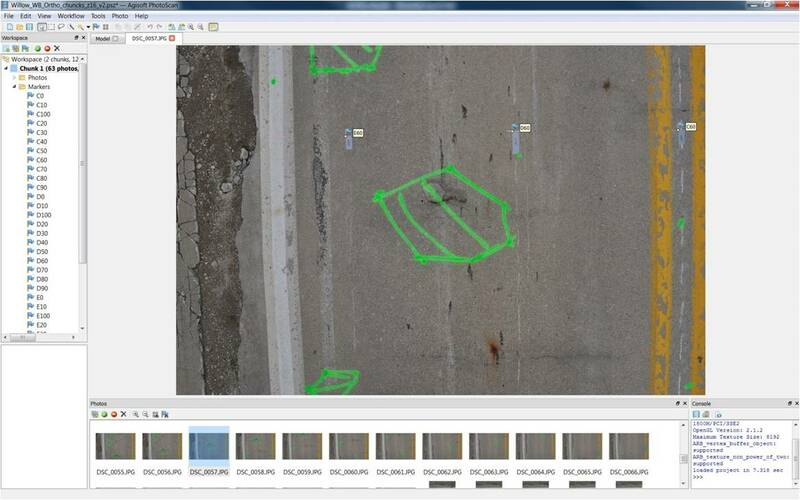 This work is supported as part of a larger program (Bridge Condition Assessment Using Remote Sensors) sponsored by the Commercial Remote Sensing and Spatial Information program of the Research and Innovative Technology Administration (RITA), U.S. Department of Transportation (USDOT), Cooperative Agreement # DTOS59-10-H-00001, with additional support provided by the Michigan Department of Transportation, the Michigan Tech Transportation Institute, the Michigan Tech Research Institute, and the Center for Automotive Research. The views, opinions, findings, and conclusions reflected in this paper are the responsibility of the authors only and do not represent the official policy or position of the USDOT/RITA, or any state or other entity. Further information regarding remote sensing technologies and the decision support system for bridge condition assessment and about this project can be found at <http://www.mtri.org/bridgecondition>. fraction of P, the anchorage force.